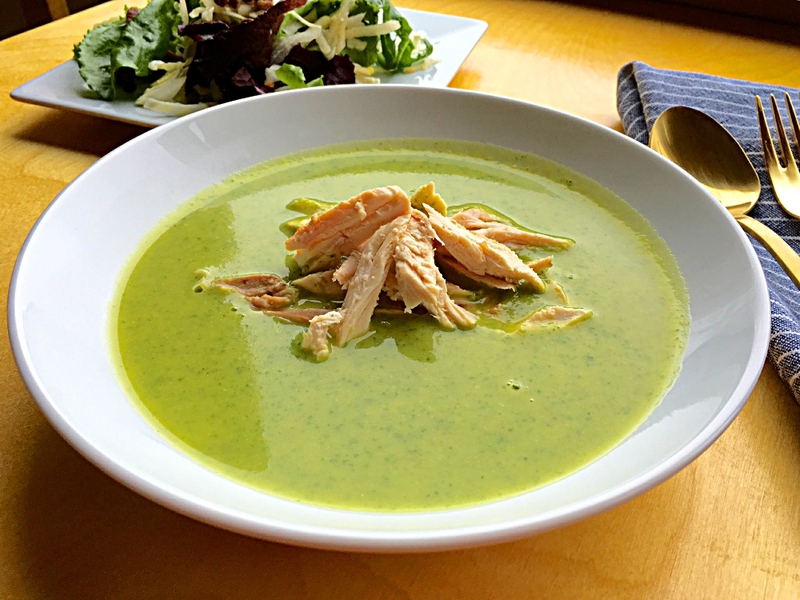 Just because winter is fading away, doesn’t mean we leave soup behind too. Have you noticed with warmer temps we crave lighter and more fresh flavors? It’s true. Every year it happens. And then I take notice. More salads gradually take over as the weather warms up. But don’t give up on soup. These off and on rainy days of spring call for hot comforting bowls of goodness. 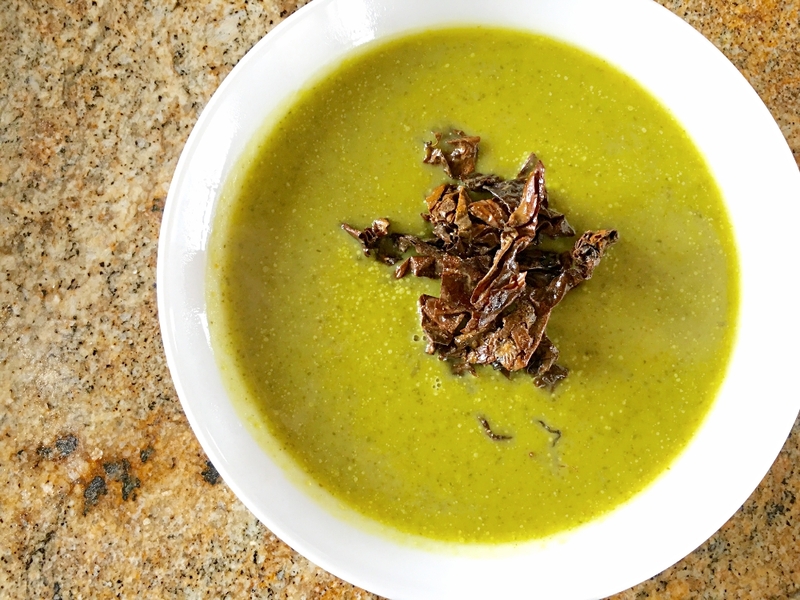 It’s time´to tuck hearty winter soups away and welcome soups that are lighter and more vibrant with color. Soon our local Farmers Markets, (or if you’re lucky enough to have your own garden) will be abundant with spring vegetables. You can easily turn these fresh vegetables into nutrient rich colorful creamy soups using clean and healthy ingredients. A few years back after our son graduated from college, he took a few years to serve in Bogotá, Colombia and teamed up with a local church there to start an orphanage. My husband and I went down to help. While he built bunk beds and I painted murals, we were treated to our hostess’s fine cooking. She served us a traditional soup made of greens, potatoes and chicken, all in a creamy puree. I’ve been dreaming of that divine soup ever since. It apparently is very time-consuming and can’t be replicated here because of the unique ingredients. This is my shortened version of that soup. And it’s a good one. 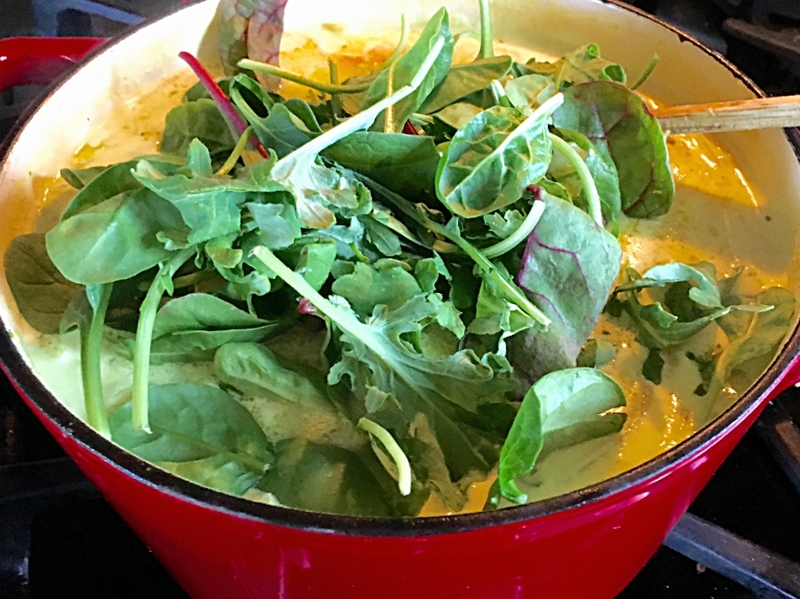 Quick to make, this Creamy Spring Greens Soup has all the ingredients to build your immune system, it’s anti-inflammatory and totally satisfying. 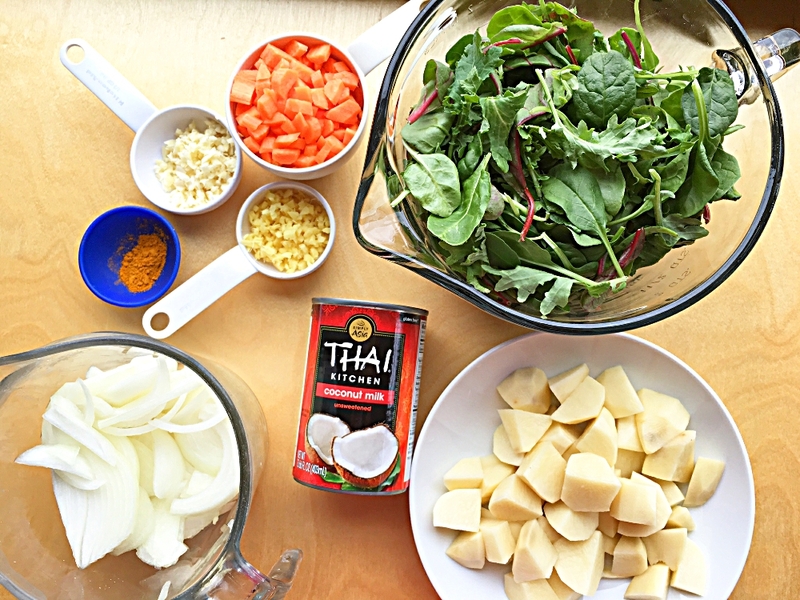 Build a delicious base by sauteing veggies with spices. Add potatoes, stock, coconut milk and sea salt. 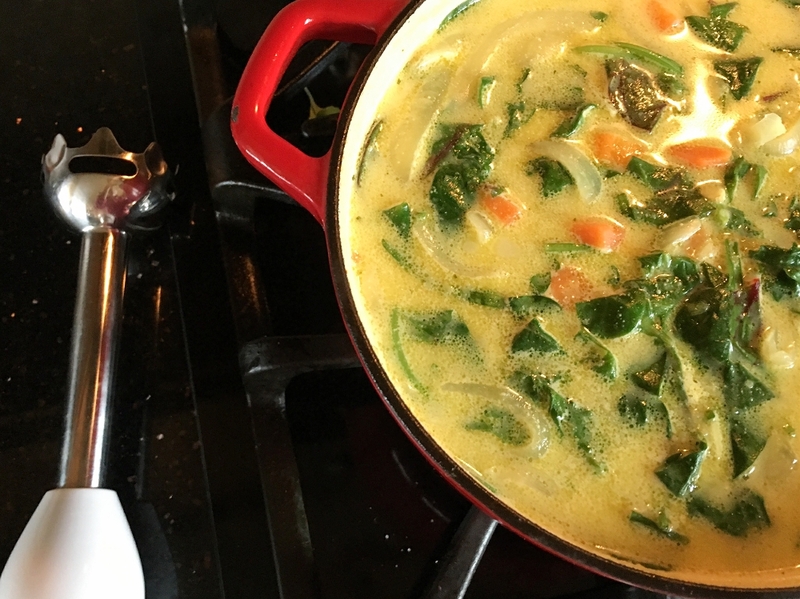 Bring to a simmer, lower heat, cover and cook until veggies are tender, about 30 minutes. 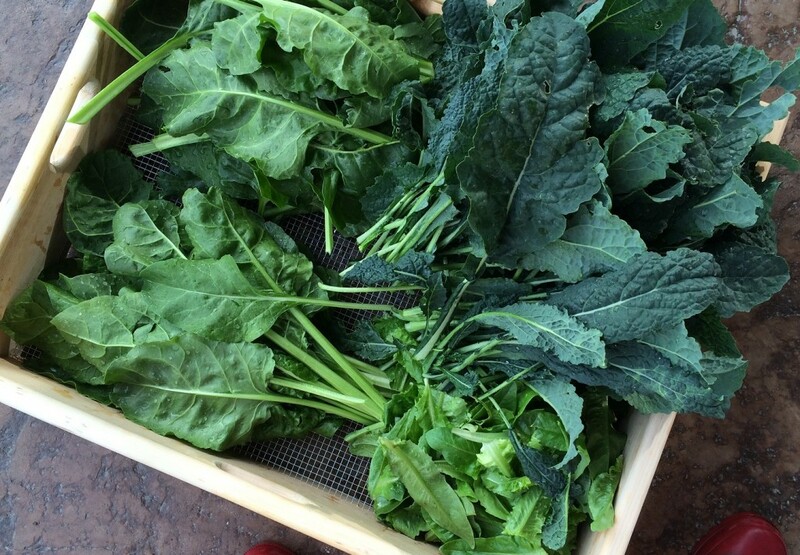 Fold greens in small handfuls at a time. (I used the chard, kale and spinach Power Greens mix from Costco because garden greens aren’t in season yet here in the northwest). They should wilt within a few minutes. Turn heat off and get your immersion blender ready. 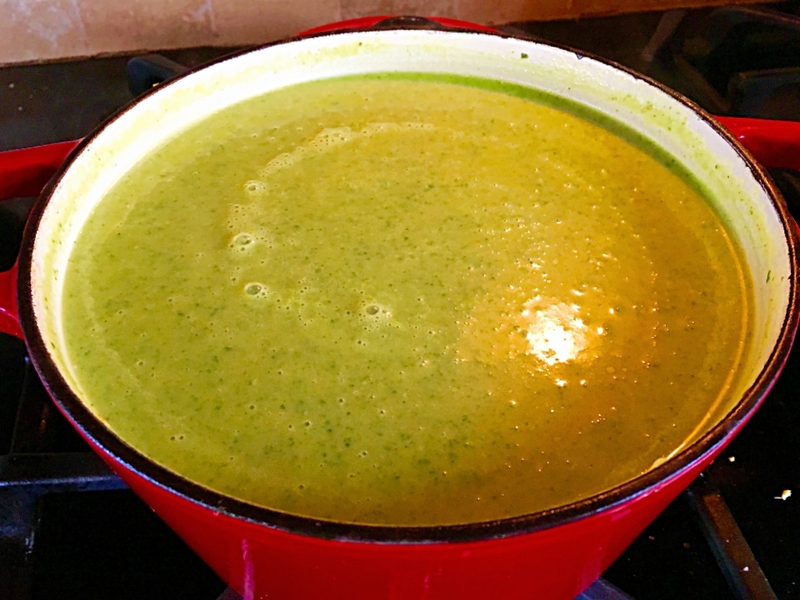 It will blend the soup into a vibrant smooth and creamy full-bodied soup. Season the soup with a tablespoon of lemon juice and some sea salt to taste. These last touches really make the flavors sing. How much salt to add totally depends on how salty your stock was. I added 1 teaspoon and it was perfect, but if your stock was salty, that might be too much for your soup. Play with it but be careful not to over salt this delicately flavored soup. To make a complete meal, I served it with shredded chicken heaped in the center with a side salad. But I also served a vegan option for lunch the following day with homemade dulse chips heaped in the center and it was the bomb! Dulse is a superfood sea vegetable with a nutrition profile that far surpasses kale. The chips are oh, so, easy to make. I initially made these iron rich snacks for our pregnant daughter who munched down the bag in minutes and the second batch was confiscated by her 2 yo. Maybe that’s another post. However, it’s so easy I might just post it on instagram where I post other too simple recipes to warrant a blog post. Give me a follow @ ag_thefreshtable to get some simple tips and recipes. And that’s all for now. Spring is about ready to bloom and I’m so ready. How about you? Melt coconut oil in a 3 quart soup pot. When oil is heated, add garlic, ginger, turmeric and onions. Saute onion mixture on medium heat, stirring occasionally for 5-6 minutes. Add the chopped carrots and saute a few minutes longer. Add chopped potatoes, sea salt, vegetable or chicken stock and coconut milk. 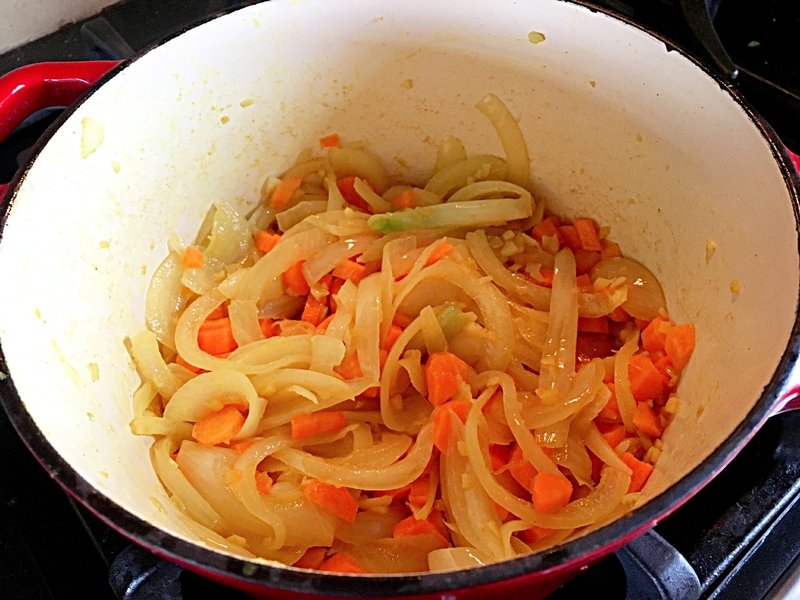 Bring to a simmer, turn down heat, cover and cook 30 minutes or until carrots and potatoes are tender. Add the greens, large handfuls at a time. Once wilted, turn off heat and blend with an immersion blender. If you don’t have one, use a pitcher blender. blend until creamy and smooth. Add lemon juice and sea salt, adjusting seasonings until it tastes just right. Serve with a helping of shredded roasted chicken in the center. I made this soup this week and it was so tasty. I shared a cup with a friend who enjoyed it , though she prefers less spice. In this recipe it is so easy to change that by reducing the red pepper flakes. Be we loved the original version! I paired mine with a mild Creamy Quinoa Primavera and we dined at home in style!